For most of us, dogs aren’t just family pets but instead part of the family. They exercise with us, play alongside our children and even sleep in our beds. But the one thing most dogs can’t do? Go to work with us. When my situation suddenly changed a couple years ago, my dog Greyson was suddenly faced with being left home alone for nine hours a day. I looked into doggy day care to decide if it was within my budget. If you work a job with long hours or go to school for most of the day, with no time to go home and visit your pooch, chances are good you’ve probably considered paying a professional to watch your dog. But doggy day care rates can be expensive. Before moving forward, make sure you can fit the cost into your budget and that the service is worth the price..
What Does Doggy Day Care Include? Before shelling out for doggy day care, research what a particular business actually offers. Here’s what a good doggy day care will typically offer. Playtime for your pup is important, so make sure your pet’s day care facility offers time with other dogs or one-on-one with a staff member. 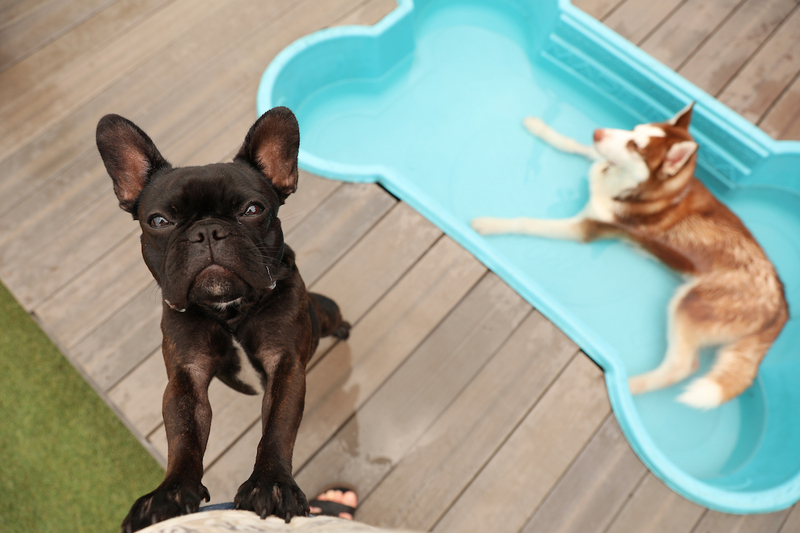 You should expect indoor and outdoor play areas with non-slippery surfaces; these play areas should be large enough for dogs to run and maneuver without issue, with designated potty areas. The facility should also separate larger dogs from smaller dogs for safety and include some climate-controlled areas in case temperatures soar or sink below freezing. Choose a location that offers feedings, especially if you plan to leave your four-legged friend all day. You’ll need to provide your own food and of course alert the staff to any food allergies your dog might have. For example, Greyson has a very negative reaction to poultry, so if I ever board him, I have to be perfectly clear that neither his food nor any treats can contain any chicken, duck or turkey. Make sure your dog is given multiple opportunities for “potty walks” throughout the day. Older dogs like Greyson sometimes require more potty breaks throughout the day; inquire to make sure the facility will accommodate. Always bring your leash from home for these walks; in fact, facilities will generally require dogs to enter and leave the facility on leash. Make sure to ask where specifically your dog will be walked — on the premises or off grounds. Playtime can get tiring! A good doggy day care will provide ample time and places for your dog to rest comfortably. Some day care centers, particularly ones that board overnight, will allow you to bring a blanket or bed for your dog. Be sure to ask ahead of time if you plan to send your pet with anything from home. Just like your toddler’s day care, a doggy day care should offer valuable mental stimulation for your dog. Be on the lookout, however, for toys that are known dangers to your dog, such as rawhides. When in doubt, consult the Humane Society’s list of approved toys and pass on any facilities that allow dogs to play with toys that pose a threat. Proof of vaccination: It may be a pain to dig up your dog’s vaccine records, but by being required to prove your dog’s health, you can rest assured that all other dogs in the facility are also up-to-date on shots. Cleanliness: Tour the facility before signing, checking to make sure it’s kept clean. Watch out for large quantities of feces and/or urine that has not been attended to. You can expect a general dog smell, but a good day care will address messes swiftly. Enough staff: Positively.com recommends finding a facility that has an “adult to dog ratio” of no more than 1:15, in case someone gets hurt, a fight breaks out or a dog starts to feel unwell. An interview: The hallmark of a qualified doggy day care is an interview process to make sure your dog is a good fit. Now is a good time to ask about the staff to dog ratio, special medications or dietary restrictions your dog might have, how the facility handles medical emergencies and any other questions you might have. Remember, the facility should also have questions about your dog’s history as well. Doggy day care rates can vary tremendously depending on where you live and the types of amenities offered. In general, doggy day cares in big cities or along the west and east coasts tend to be more expensive, in line with the cost of living. Angie’s List members spent on average $42 a day in 2014, though doggy day care prices ranged from $25 to $50 for members. CostHelper.com reported lower costs for doggy day care, ranging from $12 to $38 for a full day and from $6 to $25 for half days. As someone who has had friends have poor experiences with cheaper options, I recommend being skeptical of doggy day cares charging on the lower end. Most doggy day cares will offer monthly rates at a discount, making it the better bet if you plan to leave your dog Monday through Friday each week. CostHelper.com saw those rates range from $240 to $550. As you’ve probably learned from a lifetime of paying taxes and hidden fees, nothing costs exactly what you think. Doggy day care is no different. If the costs of doggy day care seem a little overwhelming, you’re not alone. There are some alternatives to consider — but at the end of the day, you’ll want to prioritize your pet’s mental and physical health and safety above all else. You can instead opt to have a dog walker visit your house to walk your dog while you are away. Look for a licensed, insured dog walker with positive reviews from several clients, or consider local vet techs looking to make additional money during school. Be aware, however, that the cost of a dog walker can quickly reach the costs of doggy day care. If you know someone who would be willing to stop by your house every day to play with your pup, consider offering them a reasonable rate. They will likely do it for a fraction of the cost of doggy day care, and your dog may already be familiar with them. Companies are increasingly becoming more flexible with telecommuting and providing employee-focused workplaces. Ask your boss if you can work from home or bring your dog into the office. While that might be a stretch, you can at least open the conversation to taking a longer lunch to let your dog out. In the digital age, companies like Rover and Fetch are thriving. They offer services such as dog walking, boarding, house sitting, and daycares. Consider these sites that match you with what you’re looking for, but understand that these options can also be pricey. In Nashville, a typical 30-minute dog walk through Rover for Greyson (who is 90 lbs) costs between $15 and $20. That same walk in Dayton, Ohio, where I am from originally, ranges from $10 to $15. Fortunately, I was able to make alternate arrangements with my employer to gain more flexibility to go home and walk Greyson each day, but if you can fit doggy day care costs into your budget, you’ll find that the right facility can be well worth the money. Just be sure to pick a location that both you and your pooch will be happy with. Timothy Moore is a full-time editor and doggy daddy, but he likes to devote time when he can to writing — whether it’s for his own novel or online. He is new to the Nashville area and is excited to explore the city with his partner: go Preds!